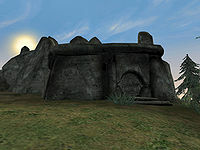 Kolbjorn Barrow is a burial ground south of Raven Rock and west of Fort Frostmoth. This is where Geilir the Mumbling sends you to rescue his friend, Oddfrid White-Lip. 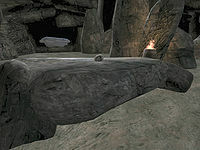 Oddfrid is a skull which can be found on an altar in the center of the main chamber. There are three pieces of raw stalhrim here, but you will need the Ancient Nordic Pick Axe to harvest them. This page was last modified on 26 March 2014, at 20:19.